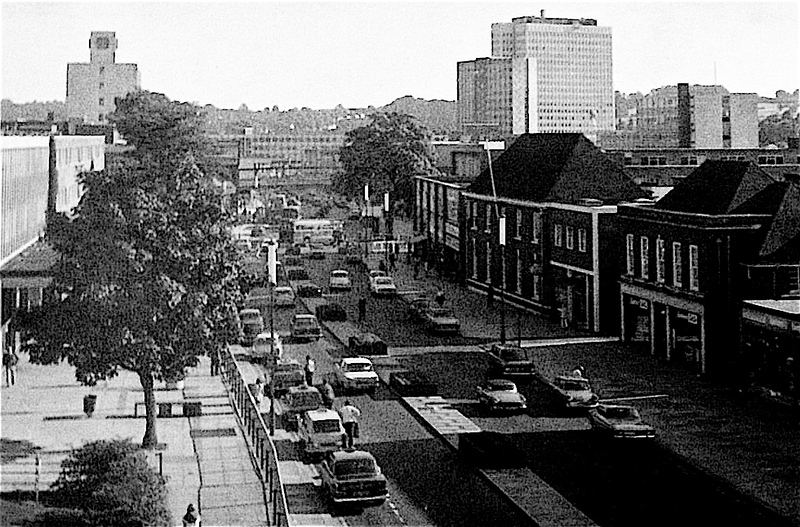 In the early 1990’s Hemel Hempstead’s Marlowes shopping mall was opened and the street became pedestrianised, but when I and my young family moved to Hemel in July 1968, Marlowes was simply the name of the busy main thoroughfare. Cars were parked on both sides of the road with a central reservation running its entire length from The Wagon and Horses pub at the southern end to The Pavilion at the northern end. The reservation was punctuated by narrow, raised flower beds sometimes referred to as ‘ coffins ‘ owing to their dimensions. 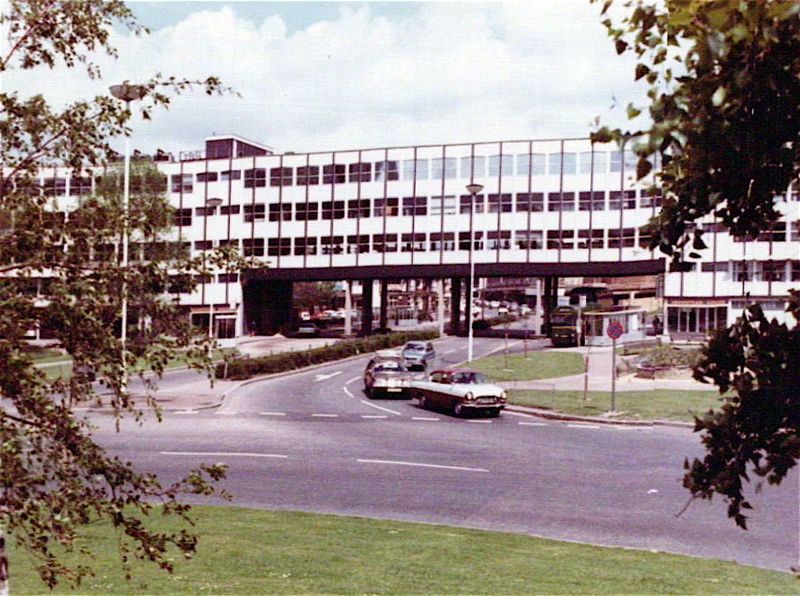 The entrance to Marlowes from the south was from a huge roundabout (not yet “magic” nor “funny”), and under a “bridge” of offices owned by BP, who occupied most of the only highrise building set back from Marlowes at the end of the Water Gardens. This was next to a round multi storey carpark, recognisable from a distance by the the orange ball on top. The nearby timbered pub, The Wagon and Horses, was the scene of many office gatherings. Hemel’s only department store – The Co-op – was housed in Quality House ( now Primark ). This sold something of everything from babywear to banking. A few doors up, there was a lovely Delicatessen selling unusual foreign foods that are probably commonplace in present day supermarkets but were a novelty in the 60’s and 70’s. Not far away was Contessa, the lingerie and corset shop, which was a far cry from today’s Ann Summers and La Senza shops. Rumbelows offered an alternative to the Co-op, with their displays of white goods, TV’s and general household appliances. In Bank Court stood the statue of the naked man before he was resited to the Water Gardens. Many years later, I bought my microwave from a specialist shop, now an employment agency, in Bank Court. I remember that Woolworth was decreased in size accommodate Comet. Woolworth was a very busy store, with a popular ‘ deli ‘ counter and a Mr Minute shoe repairer at the rear of the shop. 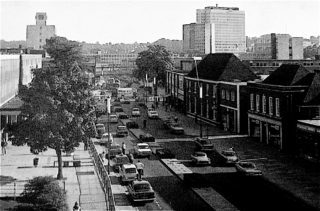 Nearby were Richards and Dorothy Perkins, selling ladies’ clothes, the chemist Timothy Whites and a small Sainsbury’s food store. Opposite , there was a seating area called Times Square with Times Furnishing store on one side. 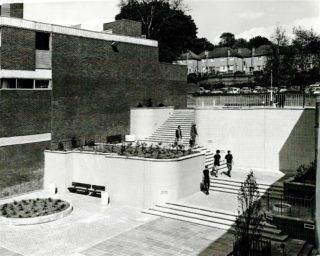 From the square was a flight of steps leading to King Harry Street and access to The Bowling Alley and the open air car park ( now West Herts Hospital ). 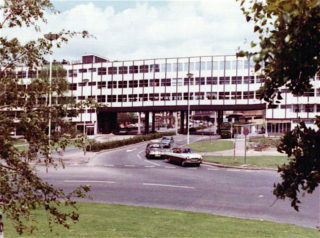 This car park was much used by shoppers at Tesco, Sainsbury’s ( later ), and Boots – all of which had rear entrances on an upper level. Other buildings I remember on that eastern side of Marlowes were a Chinese restaurant near M and S, Amy’s ‘Ardware ( later ), Wimpy Bar, a fountain, a wall mosaic, and a toy shop. On both sides of the road were a number of shoe shops-Dolcis and Olivers spring to mind but there were others. Karen’s baby shop in Bridge Street always had an array of quality prams and pushchairs on the pavement. The present Bradford and Bingley Building Society was once occupied by my favourite ladies shop, Vanity Fair. On the ramp I remember a hairdresser, Sketchleys dry cleaners, The Jade Garden Chinese restaurant – now renamed, and The Gift Box whose interior was crammed with knick-knacks at discount prices. Shirley Hall Florist stood at the bottom of Hillfield Road, whilst further up the hill was a sizeable plot of land used for car parking – nicknamed ‘ the grotty carpark ‘ on account of its (non)surfacing. This was later developed to become Bejam and a supermarket with proper parking. 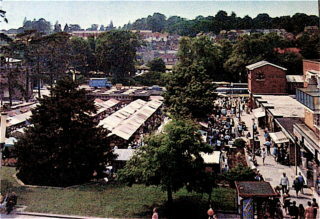 Hemel Market was a bustling place of tarpaulined stalls 3 days a week to which people came from miles around, such was the quality and variety of goods to be found. Within the market square stood a small chemist on the corner near the King Harry pub. A few doors away was a wonderful haberdashers, a shop festooned with ribbons dangling from spools above your head. The open button counter got sorted by my daughter as I waited my turn to be served. In later years I bought my sewing machine from a specialist shop on the opposite side of the square. Just round the corner was a travel agent, Nationwide Anglia Building Society and the Odeon Cinema. A visit to the fish ‘n chip shop on the corner of Combe Street was a special treat. 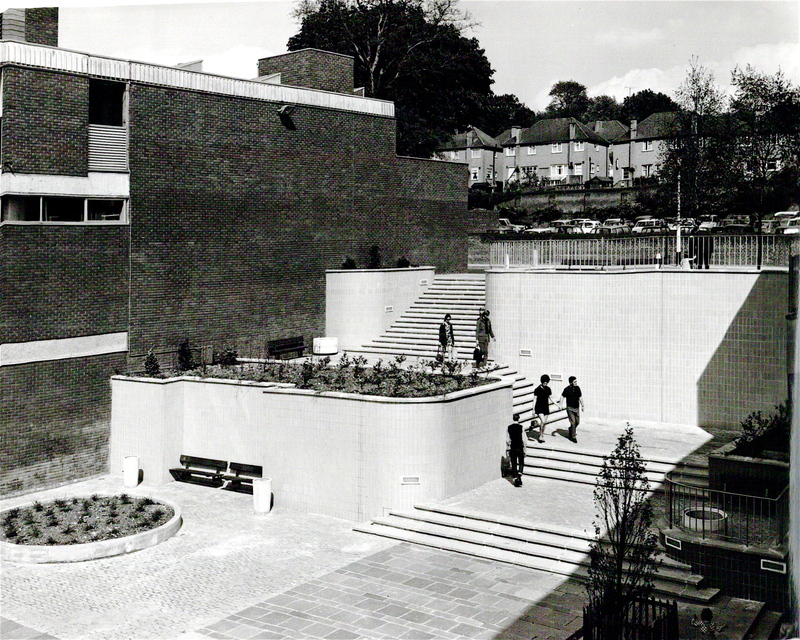 Just beyond Combe Street was The Pavilion, a much missed concert hall. The Pavilion also contained a small Information Centre and The Culpin Room, a function room which later converted to Snook’s Bar and Cafe. Tables were put outside and entertainment often took place on the adjoining green. Opposite Dacorum College was a parade of shops that I mostly did not use, though I remember a newsagent’s and an outdoor clothing shop on the corner with Queensway. Hemel Old Town ( the High Street ) had an imposing Lloyds Bank on the corner. The building still stands but the bank is long gone. The High Street housed many antique shops, a car show room, The Kitchen Shop (now the Angling Centre) with The Flower Box opposite. The entrance to this florist later became the frontage of the TV series ‘ Pie in the Sky ‘. The Flower Box eventually moved into Marlowes and the High Street Shop became a Dolls House Shop named Enchanted Castles. Wagon’s Art Supplies was the shop to visit for all art materials and more besides. Old Town Records was a haven for music lovers whilst an ironmongers, Brocketts I believe, with a shop that seemed to go back forever, was heaven for D.I.Y. enthusiasts. Model builders of all ages were catered for by 2 shops. The butcher’s shop also sold vegetables, the bakers was Mansbridge of Boxmoor, but I can’t recall a candlestick maker! At the far end of the High Street stood Salter’s the cane shop, with its square paned windows. In the 21st century, Marlowes is still a busy place with possibly a wider variety of shops but perhaps the names are those that are seen countrywide as the independent shops struggle to compete; a bonus is the plentiful supply of seats on which to rest and watch the world go by and the use of the outside cafes for refreshment too.